When designing for any diagnostic paradigm or any combinations of diagnostic paradigms, or most specifically when coordinating on-board operational run-time diagnostics (typically performed by Health Monitoring Systems and Health Management Systems by using on-board BIT sensing technologies) with off-board maintenance activities, the eXpress approach will facilitate the coordination, integration and cross-validation of the design assessment products from each design discipline. Traditionally, the FMECA assessment product has served as an excellent analysis tool for the assessment of the primary failure effects on a design or the fielded system. While the FMECA is an excellent resource for describing the likelihood of any failure and the effect resulting from that failure, it’s not an effective tool, in and of itself, to be used for any operational diagnostic decision-making purposes. While the FMECA is able to “identify” what is presumed to be “detected” at a particular design level, it is unable to analytically specify “what can actually be detected” at the Integrated Systems’ Level, as based upon the diagnostic integrity of the Integrated System. Fault Isolation assessment or implementation is not a core competency of the FMECA or any other Reliability assessment product. Due diligence in performing any Fault Isolation analysis must consider additional diagnostic design detail consisting of, but not limited to, (current design and prospective) Fault Group constituencies, (BIT) Test Coverage (i.e. including sensor coverage(s) per state-controlled dependencies) and any interrelated Test Coverage “Interference” constraining the effectiveness of interpreting status regarding any failure(s) detected or otherwise, presumed to be detected. Traditional FMECA’s also become increasingly vague when employed to assess Fault Detection or Fault Isolation in the consideration of multiple failures diagnostic scenarios. From a Fault Isolation perspective, the FMECA assessment product lacks the ability to comprehensively identify the impact of the critical failure(s) at the next level(s) as contained within the integrated systems’ design. This is particularly apparent when any WRA(s) fail(s), or may appear to have failed, then any further association to the isolation of the failure(s) is not an effective utility expected of the FMECA at the integrated systems level. This is important consideration since the IVHM must be designed with diagnostic integrity of other subsystems fully in mind. This implies the IVHM must consider the interrelated impact and the integration of any included, but independently developed FMECA’s – during design development, or at any time thereafter. Often partnering design suppliers may use their own independent FMECA tools, if any, and in accordance with their respective independent design requirements. This is inevitable. Furthermore, and since the FMECA’s diagnostic implication disconnects are not typically readily apparent, traditional design approaches do not have a consistent and comprehensive method to automatically cross-validate heterogeneous FMECAs received from partnering subsystem design teams/activities within the development life-cycle of the integrated system. This is just the beginning of diagnostically undisclosed or “loose” areas that cause voids that, by happenstance, are ignored and skipped over in the traditional approach to designing the IVHM in the integrated systems’ design development process. It is of preparedness that the IVHM is able to benefit from the opportunity to be designed in such a manner that it is able to avoid the inevitability of FMECA data interoperability complications that are not managed seamlessly or effectively in traditional IVHM design development and integration endeavors. Simply because any independently produced FMECA appears to be “right” as it appears to contain any relevant data or appears to meet the minimum independent FMECA design requirement(s), it is not necessarily serviceable to the level of expectation for continued implementation as originally believed. The degree of deficiency in the FMECA’s “rightful appearance” will be,consequently discovered later at a less opportunistic time – particularly with respect to diverging from “rightfully” expected or affordable sustainment ideals. If the traditional FMECAs are not integrated and cross-validated with interdependent interdisciplinary design assessment product artifacts, then the independently developed FMECA assessment product simply serves its own independent objectives. The systems’ integrator typically receives “flavors” of FMECAs from partnering subsystem design teams/activities involved in the design development or sustainment life-cycles. Can the FMECA be “agile” throughout “entire” Life-Cycle? The systems’ integrator must consider an “agile” path forward for the continued effective use of the FMECA assessment product, not in lieu of, but rather in addition to any current internal standard practice policies. This applies to any of its current integrated systems, any variant systems or subsystem design alternatives, or for a variety of new integrated systems in the future. “Data interoperability” is the start we need, but surely it is vastly different from “data integration”, as the latter implies a much broader capability, as we’ll discover in more depth later in this paper. The IVHM design must be able to accommodate (“consume”) independently provided FMECAs and flush out errors, omissions and inconsistencies before the effectiveness of the IVHM design can be determined. Since the traditional IVHM is not concerned with isolatable fault groups, but rather the designing of a response to any “sensed” or “perceived to be sensed” failure(s), it typically “reports” the error code(s) that triggered the sensing of the failure(s). 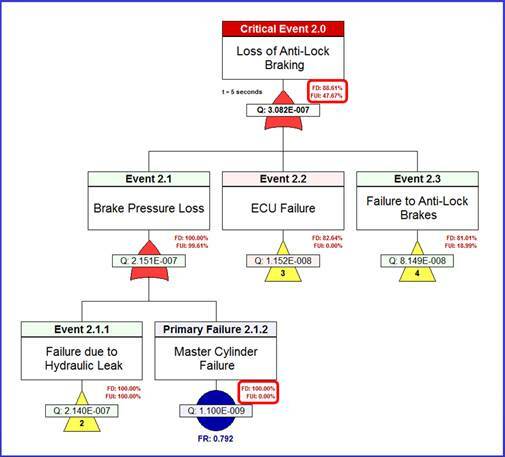 The initial remediation events on-board may, in implementation, circumvent the identified “primary” failures in the FMECA “or” more accurately, the propagating of the primary failures from the experiencing of any critical or “undesired event” as identified in the companion Fault Tree Analysis, “FTA” assessment product. The example above, is an eXpress FTA (output as generated from the eXpress Diagnostic Model) for a generic Automobile ABS System. Notice the inclusion of “FD” (Failure Detection) and “FUI” (Failures Uniquely Isolated) in RED text. 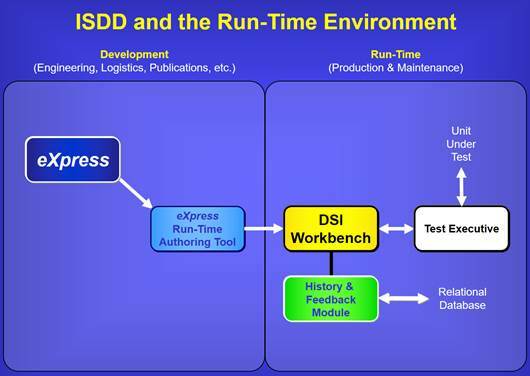 This enables the FTA to include comprehensive Diagnostic detail that is not only unique to DSI’s ISDD, but also describes the likelihood of detecting or discerning between the root cause of the failure in that branch of the FTA should the System experience that “Undesired” (or “Safety Critical”) Event. But independent of the on-board “health managing” of any identified critical event(s), the “bridging” of the diagnostic conclusions to the off-board sustainment environment(s) are typically scant or ambiguous. This is due to the design practice whereby the traditional IVHM design does not consider the practice of Integrated Systems Diagnostic Design (ISDD) as a design influence characteristic. The standard practice should be to perform the “design for sustainment” objectives in concert with the IVHM design activity. Thus, allowing the on-board IVHM to provide, or “bridge” more enriched data (as retrieved from BIT failure(s), per operational state, etc.) to ensuing and evolving sustainment paradigms enabling the formulation of more relevant and accurate “diagnostic conclusions”. The traditional IVHM’s function may be effective on-board. However, its value is reduced through its limited diagnostic “knowledge” that can be extended from the BIT failure data derived from error codes (“test results”) to the off-board or second level maintenance environment. Since the typical on-board IVHM does not concern itself with Fault Group constituencies in order to perform its primary function, it forfeits the opportunity to impact the continuity in providing more comprehensive diagnostic information for the off-board sustainment activities. This lost opportunity to provide far more savvy “diagnostic conclusions” to the off-board sustainment paradigm typically results in the requirement for much costlier, higher skilled technicians or “Responsible Engineers”. Additionally, even skilled Responsible Engineers (RE’s) lack the opportunity to fully leverage the diagnostic utility of the failed BIT codes across the diagnostic inference model(s) as attained in any specific operational states. Any degradation in the IVHM’s ability to effectively enable the reporting of comprehensive diagnostic conclusions will result in second level diagnostic uncertainty that will cause the off-board (second level) corrective actions to be broader, more intrusive, and less diagnostically conclusive. This lack of conclusive diagnostic information is one of the leading causes of false removals (FA’s), false systems’ aborts (FSA’s), no faults found (NFF’s), re-test OK’s (RTOK’s), cannot duplicates (CND’s) and myriad of incomplete or inappropriate maintenance actions being performed (intrusively) on complex integrated systems. The key enablers to improving the IVHM and subsystems’ diagnostic performance as contained within the fielded integrated systems, can be discovered in the more effective leveraging of the integrated systems diagnostic design capability and methodology. Traditional and rigid IVHM design approaches that lack the ability to equally effectively corroborate and cross validated design interdisciplinary assessment products (and relevant data artifacts contained therein) will continue the ongoing burdening of costs emanating from any of those sustainment maladies described above. But more importantly, will compel the IVHM design to be placed in undetermined re-work or update cycles. This is an unfortunate product from institutionalizing a specific “end-to-end” approach that discerns itself from a more forgiving, “agile” approach that is able to seamlessly “integrate” any new (or proposed) design in an assessment corroborative interdisciplinary manner. Traditional and rigid IVHM design approaches that lack the ability to equally effectively corroborate and cross-validated design interdisciplinary assessment products (and relevant data artifacts contained therein) will continue the ongoing burdening of costs emanating from any of those sustainment maladies described above. But more importantly, will compel the IVHM design to be placed in undetermined re-work or update cycles. This is an unfortunate product from institutionalizing a specific “end-to-end” approach that discerns itself from a more forgiving, “agile” approach that is able to seamlessly “integrate” any new (or proposed) design in an assessment-corroborative interdisciplinary manner. For the reasons briefly described above, Systems’ Integrator’s expertise with the eXpress diagnostic modeling paradigm provides an unmatched opportunity to resolve these challenges, while progressing forward to solving a host of more aggressive sustainment objectives by leveraging the Integrated Systems Diagnostics Design. The most effective path forward commences by the establishing this highly advanced diagnostic design capturing and modeling environment as early in the design development life-cycle as possible. The “interdisciplinary-inclusive” participation structure within the eXpress diagnostic modeling paradigm forms the foundation for an effective transition that collectively services the seamless and on-going enrichment of the design development and sustainment life-cycles. This highly interoperable, ISDD modeling environment allows the diagnostic capability for any design(s) to be represented within either a functional and/or a failure effect-based model. As such, this “function or failure representation hybrid” advanced capability establishes the capturing of the design’s functional or failure effect propagation interdependencies. The integrated functional and failure-effect-based diagnostic design representation(s) facilitates the (re)use of any hierarchical set(s) of models. One of the initial benefits from early capturing of design(s) in this modeling paradigm is the enabling of an “agile” (seamlessly updateable) “diagnostic assessment results transferred to operational paradigm capability” asset. As such, it can be applied on any, independent or integrated diagnostic design model(s) throughout the diagnostic design development life-cycle(s). The eXpress “Integrated System” model(s) describes the interdependent structure and functionality and any interrelated diagnostic characteristics of the subsystems contained within the diagnostics design of the “fielded product” – also used synonymously herein to describe the “Integrated System(s)”. Therefore, this eXpress Integrated System(s) diagnostic design represents not only the systems’ “functions to failure mode” relationships, but includes an ability to assess the diagnostic effectiveness that considers any mixture of groupings of tests that reflect the respective purpose and intended scope of each test set. This approach is particularly enlightening as it facilitates a robust capability to assess and influence the integrated diagnostic effectiveness for any specific or broadly general areas within the IVHM design from an interdisciplinary diagnostic design perspective. Of course, any “test set” can be modified, updated, edited or combined with any other “test set” as the design or the sustainment philosophy or technology may evolve. When the designs are modeled within the highly robust eXpress paradigm, the diagnostic inference prowess of eXpress enables the seamless extension of the diagnostic knowledge throughout any or all design components embodied within the fully Integrated System. This includes the ability to encapsulate the diagnostic interdependencies of any integrated subsystem design, and its constituents, regardless of size or complexity. As a companion benefit of capturing the IVHM design within eXpress, the eXpress model can accurately determine the Fault Groups for any diagnostic interrogation methodology as based upon any failure or group of failures observed. Although IVHM isn’t traditionally concerned about Fault Isolation, but rather a rapid Fault Detection capability in order to invoke an instantaneous remediation action, it inherently gains instantaneous operational and diagnostic status of the system. Instead of being unwittingly discarded, this diagnostic status can be transformed into diagnostic conclusions as a core competency of eXpress, once the diagnostic status is described in terms that are much more specifically meaningful for use in extended diagnostic deployment objectives. 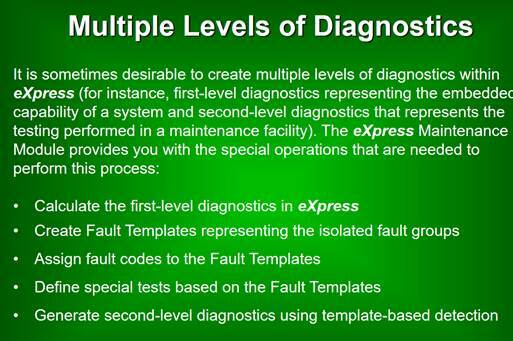 The method to extend the diagnostic status observed by IVHM to be extended for further diagnostic deployment alternatives is to simply allow eXpress to assign and manage system fault codes. Through the use of the eXpress ];, this capability is seamless, error-free, and require almost no time to produce or update. Any further changes to the design, during development or even during sustainment can be captured in the eXpress Integrated System model, and nearly instantly pushed into the operational or maintenance environment. This is a core capability that can be exercised of any design captured in eXpress. Since the highly advanced eXpress diagnostics use both functions and failures wherever appropriate to best optimize detection or isolation, failures can be described at the component level as failure modes. An advanced feature in eXpress can be used to auto-generate failure effects from the failure modes, or often component failure effects are already available and then can be imported into any eXpress design(s). 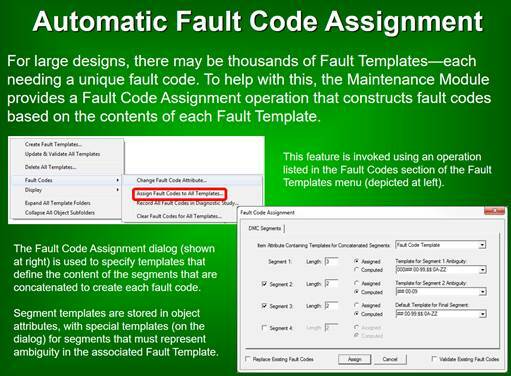 Fault Codes can be represented as a Failure Effect or a combination of Failure Effects at the higher level of the design. When any specific group of failures can be determined to be a fault signature of a specific system failure, then Fault Codes (or, Error or Trouble Codes) are typically used to represent that combination of failure at highest level of the design – usually the Integrated Systems level. 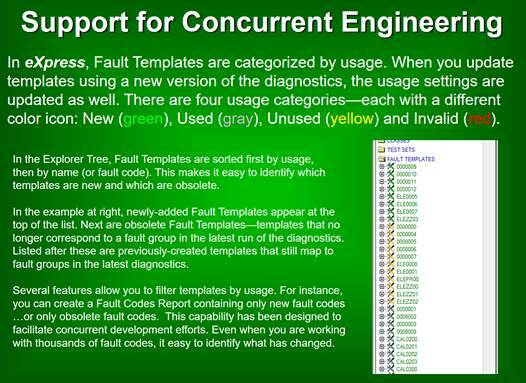 Fault Codes can be assigned to fit any specific logistical requirement by using the highly customizable “Fault Template” mechanisms. In this regard, sustainment compatibility is fully synchronized with the design’s diagnostic integrity and the design’s maintenance procedures. DiagML is a commonly used diagnostic data export facility that enables any design in eXpress to be (re)used in many other design simulation-based assessment analyses, and/or to target a myriad run-time diagnostic deployment methodologies, including ATE and IVHM. Once any design changes or updates are (re)captured in eXpress, Fault Codes can be effectively and comprehensively updated and managed internally by eXpress in a manner of a few minutes, regardless of size or complexity of the design. 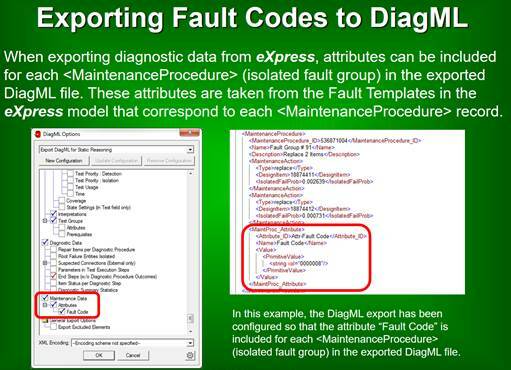 Any changes in the Fault Codes will be identified and sorted for visual confirmation or (re)exported through DiagML for operational deployment. 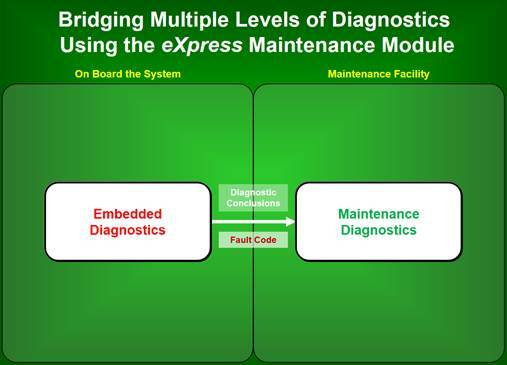 “Multiple Levels” of Diagnostics refers to eXpress’s unique advanced ability to seamlessly segment, retain and connect, the on-board IVHM diagnostic capability to be fully resumed in an off-board methodology without discarding any diagnostic conclusions gained during the operational interrogation method(s). 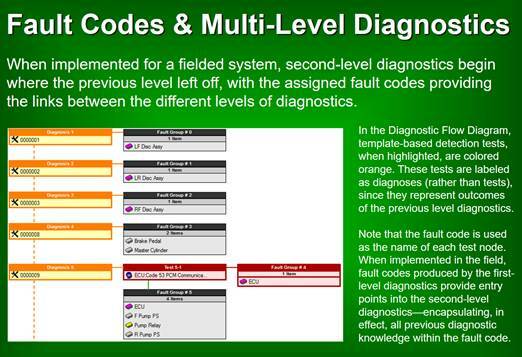 Although the IVHM may enable the vehicle to remediate around a percieved critical failure and continue its operational function, the Fault Codes that were triggered during that mode of operation establish diagnostic conclusions that will seed the depot level or any second level diagnostic session. In this regard, the second level of diagnostic interrogation will be comprehensive and not need to emulate an operational mode not otherwise possible in the off-board diagnostic environment. Gently, Integrated Systems Diagnostics Design is a robust approach that enables design teams to continue design development efforts as usual, by facilitating an interoperable data capture environment. In this manner, the same methods, tools and approaches in the creation of the initial design data artifacts can be continued to be performed by design teams as usual. At the same time, the design data will be (re)used and imported into this new eXpress model paradigm, on an iterative basis as the design develops. This process enrichment enables the opportunity to observe exhaustive diagnostic design interrelationships that are not otherwise apparent or thereby unable to be proactively managed. Essentially, this process is similar to establishing a sort of “Diagnostic CAT Scan” of the design’s inherent diagnostic integrity. As the design matures, the diagnostic design matures right in step during the design development life-cycle. The diagnostic design behaves as the “heartbeat” producing a “living” diagnostic knowledgebase characterizing the evolving nature of the diagnostic design. This will remain as an “Intellectual Property” asset that will exist throughout the sustainment life-cycle. Ultimately, we’re going to be able to leverage this “diagnostic design IP” for many purposes – advanced diagnostic assessments, operational health management support simulations and run-time implementations. In concert and transparent to the design process, ISDD opens a brand new segue to working as a much more collaborative, integrated design team. There is a distinct difference between diagnostic data “sharing” and data “integration”. Diagnostic data “integration” is only attained when the interrelated design teams are able to cross-validate their respective interdisciplinary design assessment products (and any related data artifacts contained therein) with, and amongst any other interdisciplinary design assessment products. The “designing for the sustainment life-cycle” can be timely when performed in the “design development life-cycle”, which is not a strength of traditional IVHM design methodologies. The eXpress modeling paradigm unlocks the opportunity to encounter previously unidentified diagnostic “chads” (assumptions) and anomalies in the design process. Better yet, this inherent capability enables the realization of these cost drivers early in the design development life-cycle. This is during the precious time that enables the avoidance of unnecessarily increasing sustainment costs burdened by the belated learning of lessons caused by traditional design data “sharing” errors, omissions, inconsistencies, etc. These and many other untapped design development and sustainment benefits are natural byproducts of the eXpress “designing for sustainment” agility. As opposed to data “integration”, prevailing data “sharing” activities as is ubiquitous in traditional design approaches, evade valuable data quality discovery opportunities by resorting to the use of independent and adjunct multidisciplinary design assessment products or approaches. When data is truly “integrated”, any interrelated diagnostic design assessment products ought to not only be expected to assess the integrated systems capability, but also be able to be a “turn-key” output assessment product derived “from” the agile, integrated systems’ interdisciplinary design data “knowledgebase”. Traditional IVHM design approaches that lack the ability to equally effectively corroborate and cross-validated design interdisciplinary assessment products (and relevant data artifacts contained therein) will continue to the ongoing burdening of costs emanating from any of those sustainment maladies described above. But more importantly, will compel the IVHM design to be placed in undetermined re-work or update cycles. This is an unfortunate product from institutionalizing a specific “end-to-end” approach that discerns itself from a more forgiving, “agile” approach that is able to seamlessly “integrate” any new (or proposed) design in an assessment-corroborative interdisciplinary manner. In traditionally rigid, end-to-end, IVHM design approaches, sustainment activities will also create a growing divergence from the initial IVHM design’s diagnostic (or sustainment) effectiveness, causing lessons to be relearned, recycled and reworked repetitively at undeterminable costs. Even a “Lean” approach to IVHM design may have unwittingly discounted the tremendous value of influencing the IVHM for, both on-board diagnostic design effectiveness and continued off-board diagnostic savvy. A “Smart Lean” approach would influence the balance the on-board diagnostic redundancy with the diagnostic capability and consider the impact of the diagnostic complexities in safety, mission success, availability and affordability. But the Smart Lean approach considers the ability to influence for “Smart Sustainment” during the Design Development lifecycle while considering the Smart Lean Design Development. This will enable the chopping off of many, “assumed-to-be-necessary”, repeated and costly efforts that are highly error-prone or have no ongoing value during or after design delivery. By influencing, capturing and leveraging the diagnostic integrity of the IVHM, much can be immediately leveraged for Smart Lean Sustainment activities. Smart Lean should tendered to be cyclical and repeatable throughout design development and sustainment. Furthermore, since the IVHM design knowledge is captured within the eXpress System(s) model, the ability to effectively resume or update the IVHM will be greatly eased while costs and risks of reliance on seeking vacated or displaced expertise is marginalized. Expert Diagnostic Design Knowledge captured is “IP asset” gained.